OK! Let me be honest with you, out of the 30 days or 31, I didn’t have the time to make a dinner for at least 10 days. I was so busy that at the end of the day my Nebbs just grabbed us something quick to satisfy our need for warm food. The good thing is though, that he didn’t try to hunt again and grill –when I say that, I mean, off-grid survival style. Don’t ask me –that man could live in the middle of nowhere and still survive. Anyhow, a few weekends ago, finally I got myself a slow cooker. I know… Where have I been, right? Let’s talk ’bout these D-sticks. They are DA BOMB and takes ONLY 3 things. Did I live under the rock? Seriously, the easiest chicken I’ve ever made… Oh, yeah, babe! My kids lick that stoneware dish clean. I made with it my Whole Wheat IRISH SODA bread (regular soda bread), and boy was that an amazing combo with these drumsticks, steamed rice, and coleslaw?! It was a killer meal. So let me show you what I did… You really don’t need a brain power to make it, so I hope you will give it a try… I will have some fun sharing the easiest recipes ever. ALSO, at the very bottom of the post, there will be info about the giveaway. 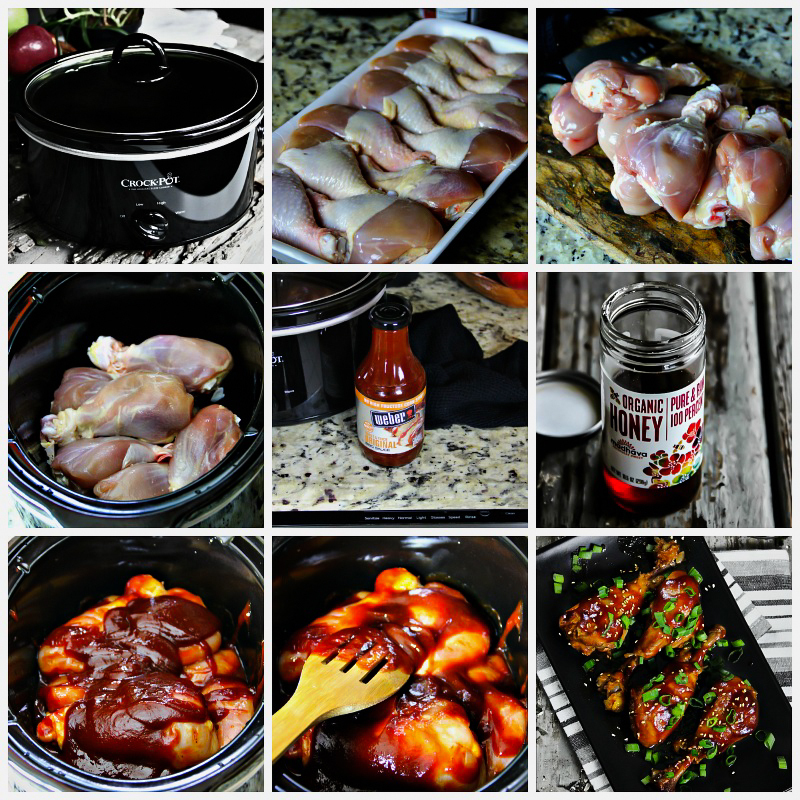 Simple, delicious and easy recipe for slow cooked bbq chicken. Remove the skin from the chicken drumsticks (if you like the skin, keep it on). Place the drumsticks in the Crockpot. Mix together honey and BBQ sauce, and pour it over the chicken. Mix it, so the chicken could be coated with the sauce. Cover and cook on LOW for 6 hours, or 3 1/2 hours on HIGH. You can use more chicken if you'd like, as well as use chicken wings if you'd like that option better. If your favorite sauce already contains honey, just omit one that is in the recipe. You can use PORK (pork chops, etc. ), instead of the chicken.